In the early 1700s a style emerged that was popular with the laboring class of England, namely the street and river porters of London. The style was dark and characterized by roasted malts and became know as a Porter. Arthur Guinness took the idea back to Ireland, increased the dark roasted profile, and labeled it "Extra Stout". Thus emerged the new style of Stouts. Peter the Great came to love the Porters during his trips to England and requested them to be sent to the Russian Imperial Courts. Unfortunately, the beer did not survive the long journey and arrived spoiled. The London brewers quickly responded by increasing the alcohol and hops, making a rich and hearty brew to survive the export. The best-known brewer of export stout was Thrale's Brewery. The reputation and enjoyment of Porter is by no means confined to England. As proof of the truth of this assertion, this house exports annually very large quantities; so far extended are its commercial connections that Thrale’s Entire1 is well known, as a delicious beverage, from the frozen regions of Russia to the burning sands of Bengal and Sumatra. The Empress of All Russia is indeed so partial to Porter that she has ordered repeatedly very large quantities for her own drinking and that of her court. The powerful imperial version of stout was brewed for the Baltic trade and was popular at the court of the Russian Tsars. The beer that became Courage Russian Imperial started life in the Anchor brewery run by the Thrale family. Barclay's Imperial Russian Stout had a long journey from London to Danzig and then into Imperial Russia, a journey made even more hazardous when the Baltic ports were blockaded by the French during the Napoleonic Wars. 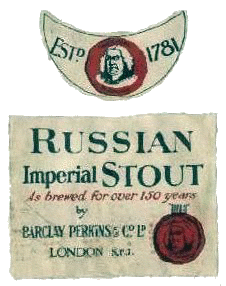 When the Russian trade dried up, Barclays - subsequently bought by a Scot of French Huguenot descent named John Courage - continued to brew small batches of Russian stout for the home market. When Courage closed its historic Horsleydown brewery in London, production of the stout was moved to John Smith's brewery in Tadcaster. It was 10 per cent alcohol, brewed from pale, amber and black malts, with a touch of Pilsner malt, and around 24 pounds of Target hops per barrel — that is four times as many hops as are used in a conventional beer. The stout had an aroma of fresh leather and liquorice, with bitter black chocolate in the mouth, and a long finish packed with bitter dark fruit and hops. As with all strong bottle-conditioned beers, Imperial Russian Stout improves with age. In 1969 vintage it was still labelled Barclays. Sadly, the beer did not long survive after Courage was taken over by Scottish Courage. The annual brew became an occasional one and then petered out completely in the late 1990s. More information on Russian Imperial Stout. 1. A contemporary name for porter. 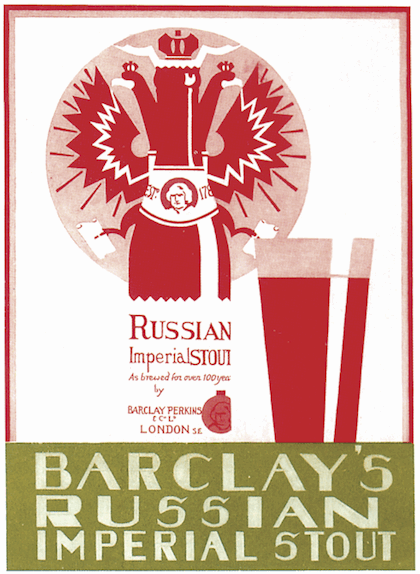 I have come across some old beer bottles, including Barclays Russian Stout, 1969. I am trying to find out how much they are worth. Can you give me an indication of its value?